My small collection of succulents can't safely be planted in my garden, though of course there are many suitable sheltered spots. I prefer to grow them in sheltered pots! 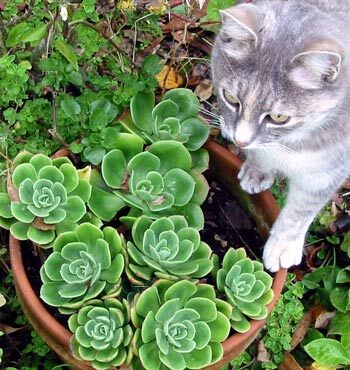 I think I have examples of the following in my succulent family - aeonium, sempervivum, echeveria, kalanchoe, sedum, and cotyledon. One of my mail order catalogues has the following introduction: 'Succulent plants are noted for their interesting appearance and the general ease in which they can be grown'. This makes them sound a bit boring, which they're not. So in an attempt to do justice to these awesome plants, here are some photos of my favourites. And you'll forgive me if I don't exactly know the correct names. I'll try and update each page when correct identification is made. Enjoy! I'd love to own an Aloe Polyphylla, a spiral aloe. Alas - I only grow a straight-up, no-twirly-nonsense one. It sits on my succulent shelf on the patio, sheltered from any winter frosts by the house wall. Agaves grow well in my garden, though I've put them in sheltered spots - and sheltered pots! Adult plants take up a lot of room, and it's unwise to put them anywhere where people might walk. Ouch - those spikes! Here's another beautiful succulent (this time a rich bright green) which I have growing in several pots, and whose name I'm not certain of. A kind reader has suggested it's a Jade Plant, or Crassula ovata. Hope I've got it right! Here I go being vague again! I've found a photograph of this succulent in a garden book which tells me it's a sempervivum. I'll go with that, until I find out otherwise. Please let me have the name of this succulent right! I grow it in pots which I placed in different garden beds. This blue and white pot sits on my patio steps. I'm in trouble - I'm not sure exactly what this succulent is called, though I'm thinking it must be a type of sedum. I adore its subtle flesh-pink colour. I bought this big succulent while on a garden visit some years ago. It's much larger than the sempervivums I've identified. And now someone has kindly given me its correct name. It's an Echeveria glauca. I'm in trouble again! I think this beautiful blue succulent is a type of sedum. Help! This chocolate coloured echeveria lives in a pot on the house decking. The first thing I did when I bought it (in a nursery sale) was divide it up into several separate plants.